Porter Autoclave ...Two chamber sizes that can fit most clinics. PORTER SES 2000E and 2012E are matched to today's sterilization procedures and to the heightened demand for sterilization vigilance. Your attention can be concentrated on the demands of your practice with an automatic steam sterilizer system that monitors every step of the process...even with print-out verification. 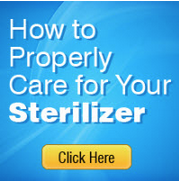 Your staff will appreciate the ease of use and quick turn around times of the Porter Sterilizers. USE: For the sterilization of instruments, handpieces, utensils and other items in trays, pouches and cassettes. USE: For the sterilization of instruments, handpieces, utensils and other items in trays, pouches and cassettes. SIZEOverall: Height 18.1", Width 18.1", Depth 14.2"
Chamber: Diameter 7.9", Total Depth 13.7" One-piece vessel manufactured from 304 stainless steel. Cassette Capacity: Cassettes (2) 4 1/2"x8"
Weight: Net: Approximately 64 lbs., plus tray carrier and trays. Chamber: Diameter 11.8", Total Depth 14.7" One-piece vessel manufactured from 304 stainless steel. Trays: Small (1) 11"x7"x 1/2 " Large (4) 11" x 8"x 1/2"
Cassette Capacity: Cassettes (4) 8"xc11"
Weight: Net: Approximately 155 lbs., plus tray carrier and trays.